Self-care is the most powerful preventive health tool we have. Yet, ironically, it’s a tool that few of us use – at least not consistently. Instead, we’ve become passive dependents on a broken, overpriced health care system that is far from accessible (unless, of course, you’re a wealthy member of Congress). And that’s precisely why now is a good time to redefine self-care. We hold a great deal of power when it comes to our health. Now, I realize there will be critics who reject the idea that we possess this power. Many have argued that the notion itself perpetuates victimization – for example, the idea that a person with diabetes is somehow personally responsible for it. That’s not what we’re talking about here. Self-care is a preventive strategy that serves to enhance our quality of life. Taking responsibility for our lifestyle choices doesn’t make us a victim any more than ignoring our role in our health does. And since self-care also includes managing existing conditions to prevent further progression, that argument just doesn’t hold up. While the truth is that, yes, at times our personal choices do play out quite visibly in the form of chronic disease, there are also cases where our best efforts at taking care of ourselves are no match for genetics or environmental forces: The non-smoker who is diagnosed with lung cancer, the athlete who is being treated for heart disease, the happy-go-lucky person who is secretly battling depression. We can’t control every variable in our lives, but we can certainly make adjustments that move us closer to good health. And that’s where self-care comes in. 1983 World Health Organization Self care in health refers to the activities individuals, families and communities undertake with the intention of enhancing health, preventing disease, limiting illness, and restoring health. These activities are derived from knowledge and skills from the pool of both professional and lay experience. They are undertaken by lay people on their own behalf, either separately or in participative collaboration with professionals. 1998 The Role of the Pharmacist in Self-Care and Self-Medication Self-care is what people do for themselves to establish and maintain health, and to prevent and deal with illness. It is a broad concept encompassing hygiene (general and personal); nutrition (type and quality of food eaten); lifestyle (sporting activities, leisure etc. ); environmental factors (living conditions, social habits, etc. ); socioeconomic factors (income level, cultural beliefs, etc. ); self-medication. 2009 World Health Organization, SEARO Self-care is a deliberate action that individuals, family members and the community should engage in to maintain good health. Self-care is the ability of individuals, families and communities to promote health, prevent disease, and maintain health and to cope with illness and disability with or without the support of a health-care provider. 2008 Mosby’s Medical Dictionary, 8th Ed. The personal and medical care performed by the patient, usually in collaboration with and after instruction by a health care professional. 2015 Global Access Partners, Australia The activities people undertake to stay fit and maintain good physical and mental health, prevent illness and accidents and avoid unnecessary risks. It includes self-medication for minor ailments and chronic conditions and actions taken to recover after acute illness or discharge from hospital. Responsible self care requires good health literacy and communication with health professionals including pharmacists and GPs. 2016 Department of Health, UK The actions individuals take for themselves, their children, their families and others to stay fit and maintain good physical and mental health; meet social and psychological needs; prevent illness or accidents; care for minor ailments and longer term conditions; and maintain health and wellbeing after an acute illness or discharge form hospital. 2016 Self-care use patterns in the UK, US, Australia, and Japan: a multinational web-based survey, Integrative Medicine Research The practice of self-determined home healthcare activities using appropriate products…without guidance from healthcare professionals. But, while these definitions do address some aspects of empowerment, they don’t encompass its breadth. It includes far more than just caring for ourselves after we’re discharged from the hospital, and it certainly doesn’t exist independent of guidance from our healthcare professionals. Self-care is a preventive health strategy involving actions and behaviors that improve, restore, or maintain good health. Essentially, it includes anything and everything we do for ourselves that supports good health. Creating a personal practice involves making deliberate choices about how we want to experience life. It’s not just about avoiding illness; it’s about designing a life we love. So, is self-care the answer to our health care crisis? In some ways, yes. An emphasis on prevention would certainly reduce our dependency on the health care system as a whole, and reducing our utilization of services would also reduce the outrageous expenses that often come with them. But let’s not forget that the goal of self-care is not to make traditional health care unnecessary or obsolete. The primary objective is for us to begin leaning into our power – the power to make medical decisions without feeling bullied by the system, the power to treat health care providers like the consultants they truly are (we are the ultimate decision makers), and the power to vote with our wallets for the kind of care we believe is right for us and our families. Self-care offers everyday Americans an opportunity to be part of health care reform. Self-care is what we do between doctor’s appointments, so if you really think about it, aren’t you your most important health care provider? Even so, self-care does have limits and highly trained medical professionals still have a role to play. (A big role.) Ready or not, health care is changing. With a clear understanding of our needs, and a plan in place to meet those needs, we can navigate our well-being in a way that aligns with who we are as individuals. As mentioned, self-care is about designing a life we love. Are you ready to design a self-care practice that you love? 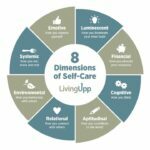 Design your own self-care practice with Living Upp’s self-care ecourse.